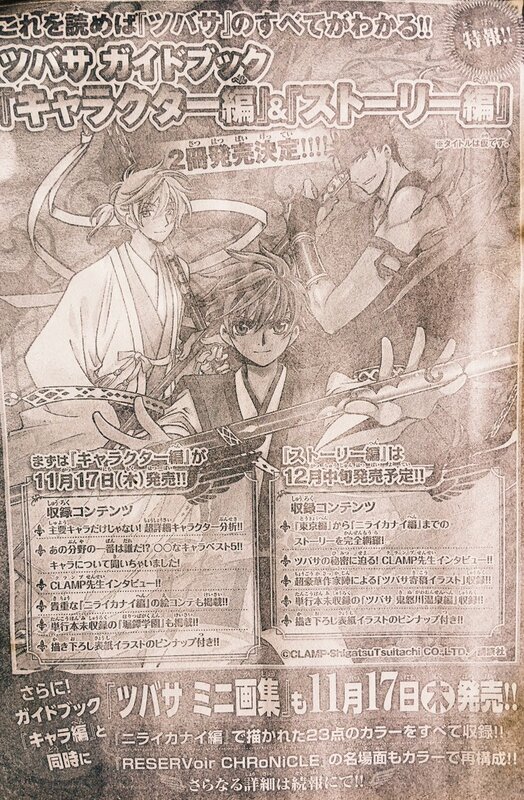 This week’s issue of Weekly Shonen Magazine is announcing the upcoming release of two Official Guides and a mini artbook for Tsubasa. This are sure good news! I’m glad we won’t have to wait too long to have the color illustrations of Nirai Kanai hen. It would have taken many more years to fill another artbook with the same length as the previous two ALBuM De REProDUCTioNS. I am curious about which illustrations from RESERVoir CHRoNiCLE will be selected. Instead of reprints, it be would be much better if it were the colored comic pages that were in neither of the artbooks. I counted 20 color illustrations for WoRLD CHRoNiCLE and 3 for each special limited edition cover, but maybe I miscounted… I’m not sure if the covers of the special editions of volumes 1 and 2 would be counted as WoRLD CHRoNiCLE or RESERVoir CHRoNiCLE ^^” Either way, I hope they all get included in this mini artbook. And two guide books? That actually took me by surprise. The contents were divided in a way that makes it hard to pick only one. I mean, I could live without the character surveys, but the storyboards and interviews are always so interesting! I hope they’ll include character sketches and unreleased materials. Definitely looking forward to all 3 of them! Special thanks to Manga Mag Japon for kindly letting me know about this. Update: The release dates for all 3 books have been postponed. Source: CLAMP-NET.COM. Wow, those Guide Books look like must-buys to me. (Maybe I can finally revise the CCS/TRC/HOLiC timeline and get it down for good!) I wonder what the prices will be like? I agree. They shouldn’t be costy. This was so out of the blue but I’m not complaining =D I’m looking forward to the two CLAMP interviews plus storyboards plus concept materials and I hope we get a timeline ! Agreed on pricing. The guidebooks should be the same format as the previous two (regular Shonen Magazine books) and the artbook must be cheaper than the previous two considering its length. I’m actually really excited about this! When I heard about ‘mini artbook’, what came to my mind was Wish artbook (memorial illustrations collection), do you own it? I personally have it: the dimensions are 15×21.5cm, it got a thick hard cover + dust cover and a total of 90 pages (49 illustrations + 16 pages epilogue chapter). Not too sure how the TWC one will be, maybe a thin A4 book…? Yes I also own a copy. I also thought about it… but I wonder if they meant mini due to its measures or simply due to the amount of pages. Having it the same as the Wish artbook would make it quite different from the previous two artbooks. I guess my entry didn’t appear because I put a link in it: it was about the books above being listed on clamp-net.